Imagine you’re putting together a few must-have essentials for locs hair care. Did you add in a brush to the necessities? If not then you’d better reconsider because Loc Brushing can drastically improve the health of your locs! 1. Reduces Build Up. Loc Brushing helps to remove trapped oils in your locs which are magnets for lint. 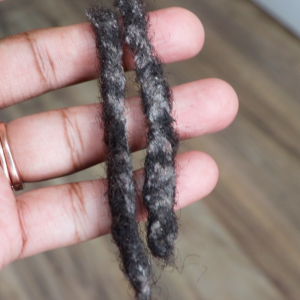 Once lint is in your locs, you can use Loc Brushing to help dislodge it, remove dead skin cells (dandruff), and other buildup that may have become trapped inside your locs. 2. Conditions & Controls Frizzy Hair. Frizz is caused from lack of moisture and Loc Brushing helps to spread your natural oils from your scalp to the ends of your locs and hydrate the locs while taming any frizzy hairs in the process. 3. Makes Your Hair Grow. Loc Brushing invigorates the hair follicles with the bristles of the brush, bringing more blood flow and oxygen to the scalp while promoting hair growth. 4. Prevents Breakage. Loc Brushing helps to evenly distribute moisture from the roots to the ends and when your hair is properly moisturized you’re less prone to breakage. 5. Detangles Roots. Whether you have Sisterlocks or are Semi-Freeforming, you know finger detangling can be time consuming. Loc Brushing helps to separate tangled hairs and give a neater appearance. 6. Therapeutic. Practicing Loc Brushing gives you a moment to connect with and nurture your crown. Each brush stroke makes your scalp and locs feel refreshed (from my personal experience!). You can incorporate Loc Brushing into your regimen in several different ways. To help remove dirt, build up, or lint from your locs, dry brushing is a great solution. Dry Loc Brushing is when you use a brush on your locs when they are not wet. Using a brush on dry locs will quickly help to dislodge and remove buildup from the surface of the loc and a few layers within the loc matrix that you can’t completely get with shampoo. With that being said, I recommend practicing Dry Loc Brushing before you shampoo your locs as a Pre-Shampoo treatment. When your locs are wet you can use a brush to thoroughly moisturize your hair. In the past, I moisturized my locs with water and overlapped it with a sealant however my locs still felt dry in certain areas. Instead of just hydrating the outside layer of the locs, brushing the locs while wet and then brushing the sealant in will ensure full coverage and deeper penetration of moisture within the intertwined hairs. My professional recommendation is to use a Soft Bristle Brush, preferably made with natural fibers, such as boar bristles. The bristles of a boar bristle brush are most similar to human hair and will strengthen and add natural shine to our hair. Do not use a brush with hard bristles because that will damage the loc matrix and potentially cause breakage or thinning. It is better to invest in a quality, professional soft bristle brush now, than to pay the price of loc repair later. You want to be sure to begin loc brushing at the right time. 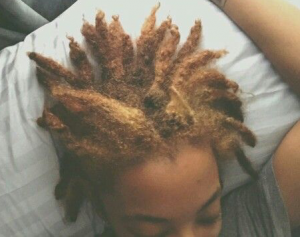 If you are just beginning your loc journey, it is best to wait until the majority of your locs have buds on the ends and are in the teenage phase before you start Loc Brushing. Attempting Loc Brushing before you reach the teenage phase puts your locs at risk for unraveling so, at this early stage, it’s better to take preventive measures against lint and buildup by protecting your locs at night and using natural products. Once your locs are in the teenage phase and beyond, it is recommended to incorporate Loc Brushing into your regimen. You can practice wet Loc Brushing daily or as a post-shampoo treatment and/or practice dry loc brushing as a Pre-Shampoo treatment. For a demonstration and tips on how to incorporate Loc Brushing into your regimen watch the video tutorial for “Loc Brushing 101“. How often do you brush your locs? You have more experience than me in the industry but I also am a Licensed Cosmetologist with a focus in natural hair and locs. In my personal experience and observing other loc rockers that brush their locs and have reaped all the benefits so we will have to agree to disagree. Just saw the viewing if license brushing. Thanks for posting it. Question, can people just getting LOCS in their hair (the length of your pinky finger & or the length of a small needle), can they also loc brush their hair as well? You mention “teenage years” in LOCS. How long does it take for your locs to enter the teenage years? How long is teenage years in locs? I agree, only brush the locs! I am so glad I’m not alone as a believer in Loc Brushing! I love brushing my locs! It does give you that connected, bonding moment… I use soft brush with my oils poured on bristles after I wash hair. It helps to add shine to dry locs without saturating hair. It also stimulates edges. Thanks for your tutorials. I will have to say that I agree with loc brushing, I don’t do it very often, maybe like once a month. I haven’t had a lot of free time to do any maintenance on my hair. Brushing is quick and easy to do and with my soft texture it keeps the frizzy flyaway hair under control. I have noticed that my locs feel more conditioned after brushing them, so I go easy on the conditioner . Yes! It makes a huge difference. Thank you for sharing your experience! I will be getting sisterlocs soon. Thanks for the info. I have a lot to learn about the maintenance and care of them. Can you brush your locs if you have thin, tightly curled hair? The use of the brush is more so dictated by what stage of the locking process you are in. If you have healthy mature locs, then yes you can brush them using a SOFT boar bristle brush. I have a question about loc brushing. Is it possible to brush the locs daily, or only when the locs are wet and before washing the hair? My locs are pass the teenage years, and I have been loc’d for two years. I brush my mature Sisterlocks once a week and not extensively. Sometimes when wet and other times to neaten. It works for me but I wouldn’t recommend daily brushing. I wonder if texture makes a difference too. I began brushing my locs for the first time. My locs are 6 years old. I tell you loc brushing has been phenomenal. My locs are thinning and breaking off. They were dry even though I moisturized. Since i’ve started brushing, i’ve notice a difference. My locs are so much softer and healthy looking. I am not going to twist them as often as i used to. i want them to get thicker. I am so glad I found this site. I will learn how to properly care for my locs and get them thicker. I am happy to help Jaron and so glad that it is working out for you!! 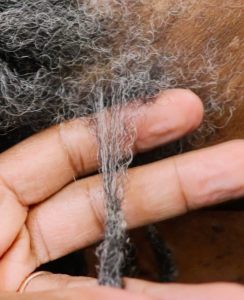 I would never have thought to brush my locs until after reading this article and watching the introductory video. My hair texture in the front is looser than in the back, so it always seems fuzzy to me. Rather than retwisting more often or using a “hard hold” product. I’m going to try brushing my locs once a week or so for the next month (July 2018) and report back. Hey Dianne! How did the loc brushing work out for you in lieu of frequent retwisting? Looking forward to hearing about your experience! Thanks for sharing! I am definitely going to try wetting the brush instead of my locs, great tip!